Practice sessions were allowed for all players after team registration from 12.30pm, and it was evident, judging from the whooping and hollering, that there was a strong competitive spirit emerging. After a ‘spider’ competition, the match got under way at 2pm. As most of the visiting teams were players who never, or rarely played any bowls at all, a handicapping system was introduced to even out the scoring. The match was played with sets of 4 ends with changing of rinks at the end of each set. A good number of spectators had taken up positions around green in the warm sunshine to watch the amateurs against the club members. They had of course taken advantage of the tea, coffee and cakes that were on offer in the clubhouse. Also available was a Sue Ryder Tombola and a donated Cake Stall. The match concluded at around 4.30 and, after much calculation our adjudicator handed the Chairman the results for 1st,2nd and 3rd. Prize giving was carried out by the Chairman and Club President. 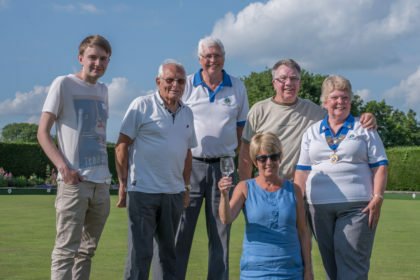 All participants said that they had enjoyed the afternoon, in particular the Disability Bowls England team who signed up on the spot to bring a team to our inaugural Gala Match in August.